Test your baseball skills as you try to dunk a friend or family member. 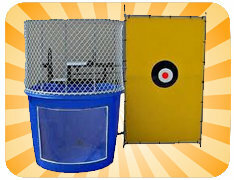 Our dunk tank is great for picnics, team competitions and more! The base cost is for 4 hours. It can be reserved for additional hours at $25.00 per hour. 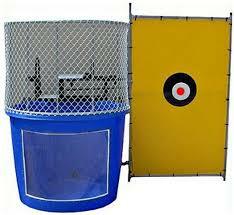 Our dunk tanks require a flat surface for set up that is about 30 feet long by 20 feet wide for set-up. An outdoor water faucet needs to be available within 75 feet. Our insurance requires that those that use the Dunk Tank be at least 18 years of age! Sorry, no exceptions!